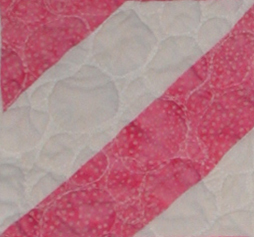 I recently led a “slice” quilt collaboration with 9 other textile artists in Kalamazoo. The project began with my panoramic photograph of our downtown Bronson Park, an iconic two-city-block community space adorned with fountains and gardens, home of summer concerts and art fairs, winter twinkle lights and fireworks. In short, this park is near and dear to all our hearts. The photo was “sliced” into ten sections, and each artist was challenged to reproduce one as a 15″ by 30″ art quilt. The rules were simple: careful placement of sidewalk lines where they intersect a neighboring piece. Otherwise, participants were encouraged to use any techniques and materials necessary to interpret their slices artistically. The result is a collection of diverse and varied slices that work together to portray the park. They are a joyous testament to vibrant beauty and diversity in community.